Derek Abramovitch, Chief Relationship Officer In a time when business competence is measured by the volume of technology entities a company has invested in, it takes real confidence to make a bold statement like “We do not invest in technology.” Defying convention in style is Derek Abramovitch, the Chief Relationship Officer of Vigilant. Making his case, he adds, “We invest in partners that have the technology; this is how we have created the difference for Vigilant and its unique value proposition in a market that changes every day, without notice.” Combining global trade and financial compliance expertise with the know-how of leveraging technology on behalf of its clients is Vigilant, a company on a mission to keep companies compliant. At the highest level, challenges in the trade and finance world rear their ugly heads in the form of identifying the right type of experts. “Since trade compliance is somewhat different than other career paths, one can’t really go to school to become a trade compliance professional, as one would to be an accountant, doctor, or a lawyer,” Abramovitch explains. The result is a shortage of qualified people who can deliver the work. Very often, people who have been working in trade and financial compliance get promoted to more strategic roles and lose the experience in doing the tactical work. More so, the geographical proximity of the talent pool may often prove to be an unfavorable condition to the business. Secondly, a decade or so earlier, hesitations surrounded the notion of managed services and very few companies were receptive to the idea of exporting their data to the cloud and outsourcing their processes to an MSP. As more people come to terms with the highly fluctuated nature of the trading world—where sanctions and embargos are imposed even on economically strong nations and laws change in terms of frequency and velocity—a massive paradigm shift was inevitable. In this sea change that was underway, Vigilant found an opportunity like never seen before, as companies started to become more open. “Our message has always been: for our clients, trade or financial compliance is not your core competence; for Vigilant, it is our niche. We take the tactical and operationally challenging compliance work off our clients’ shoulders so that they can focus on their core business and allow us to handle the day-to-day, operationally challenging compliance, which is our forte,” adds Abramovitch. Founded in 2005, Vigilant has built a highly successful network of partnerships, alliances, and clients. 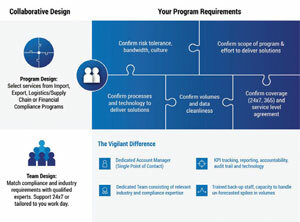 Although Vigilant initially focused on supporting trade compliance programs, similarities with many aspects of financial compliance and the desire for more multinationals to manage both trade and financial compliance on a single platform has lead to Vigilant’s expansion into supporting both trade and financial compliance programs. When it comes to implementing a compliance program, most companies must consider their risk tolerance versus the ongoing cost to support a compliance program. Global trade management (GTM) platforms like SAP GTS, Oracle GTM, and Descartes CustomsInfo enable companies to expand the scope of their compliance program while decreasing the costs of ongoing support by automating import and export processes. Whereas Financial Crime (KYC, AML) platforms such as Global RADAR that were once leveraged only by banks and insurance firms, are now being implemented to support multinational companies concerned with managing trade and financial compliance data on one platform. For businesses that are involved in international trade or facilitating international transactions, Vigilant helps in what is called screening sanctions, which is a company’s responsibility to adhere to a certain government’s trade restriction policies. Several countries impose limited sanctions—controlling the import/export of selected goods or parties—or embargos, where they enforce a ban on all commercial activities. Once cleared for importing or exporting of the products, the business has to ensure they comply with various tariff classification policies, support FDA and other compliance mandates so that they can move their products cross-border and adhere with local regulations as well. Businesses realize that once they implement a GTM solution or a Financial Crime screening solution, and the application transitions into a live environment, it frequently creates more work, as the GTM platform allows them to address gaps, risks, and challenges that went unnoticed before. For instance, a business that was previously screening “X” amount of transactions or business partners now has the capacity to scale up its screening ability and can do a more comprehensive scope of the program. As a result, the output of data they have to manage grows multifold, and this is where a trade and financial compliance MSP like Vigilant fits the bill. The Vigilant team helps its clients in assessing areas of vulnerability, removing avoidable costs, minimizing risk, and ensuring compliance with the ever-changing global trade rules and regulations. In delivering comprehensive and client-specific compliance solutions, projects, and programs, they assist in product classification, sanctioned/restricted party-screening, free trade agreement support, merger or acquisition compliance support, to name a few. When confronted with a challenge, Vigilant assesses the client’s existing process workflow and the GTM or Financial Crime software they have implemented. Quite often, it happens that the client would not have the means or the expertise to know if the technology responds to their needs. To top it off, they may lack the budget to upgrade or reconfigure their technology. Based on their assessment, Vigilant offers a compliance optimization program, where they step in to study the company’s culture, their view on compliance, and their bandwidth to support an ideal program. For instance, when the sanction screening program used by one of their clients had too many gaps such as the omission of certain transactions, outdated lists of countries in which they can conduct business, and prolonged duration to clear a potential match, they realized they needed the help of an expert. Enter Vigilant. They delivered their Sanction Screening Program Optimization solution, upon assessing the current state of their program, where they deduced that their existing solution was not configured properly, due to which the application sent irrelevant alerts. “We worked with our client to define their desired state and implemented their specific roadmap to deliver an optimized compliance program, which confirmed new scope for the program and optimized the lists and solution settings to reflect risk tolerance and geographical reach of the client,” says Abramovitch. What’s more, they reduced the potential match rate from 16 percent—which was much higher than the industry average—to three percent and reduced the average time to clear a potential match by 60 percent. The client reaped the benefit of additional costs savings of up to $100,000 annually. One of their unique differentiators that sets Vigilant apart from the crowd is their belief in allocating dedicated teams for their MSP program. “When we build a team for our clients, we employ exclusive account managers and specialists, where we match resources and staff the team based on their industry and compliance expertise,” adds Abramovitch. Every once in a while, a technological innovation comes along and revolutionizes an entire industry. Each has its own benefits and hurdles. For the trade and finance compliance world, machine learning and artificial intelligence (AI) are all set to make their grand entrance to help businesses automate their trade and financial management processes. Meanwhile, the costs involved in training the system with a business’ data can take significant time. On its part, Vigilant is making significant investments in identifying the right technology partners providing AI and machine learning that can take out some of the tactical redundant aspects of delivering compliance. "We believe it’s our responsibility to bring value to our clients and allow them to select the right technology so that, we can sit on the same side of the client and negotiate"
Blockchain is another area that is much talked about in the circles, both from a supply chain and compliance perspective. Given that blockchain is an expensive technology in the way it consumes power, Vigilant is in talks with some of the providers/partners regarding how to leverage technology in a way that can guarantee ROI for its customer. “At the end of the day, it all boils down to balancing the needs of the market with the needs of the client, and matching that with technology partners to ensure what is communicated to the market is truthful,” states Abramovitch. In times like this, an effective trade compliance MSP like Vigilant comes as a surefire in mitigating risks, increasing compliance, creating operational efficiencies, realizing potential savings, and improving bottom line profits.